I had a classic Khorne CSM army way back in the days of 3rd edition. It was fully painted in the classic World Eater paint scheme, complete with Rhinos, Juggernauts, etc. Then I grew bored of 40k and foolishly sold the army. Flash forward to today and I want to put together another Khorne army. Granted, it helps that Berzerkers are pretty decent again. Unfortunately, the official Berzerker models haven't changed at all, looking incredibly dated, so I opted to use a quick kit bash of the AoS Blood Warrior model as my Berzerker. I didn't want to do the standard Khorne color scheme, so I spent some time browsing for other ideas. As I was perusing through google, I came across this image of a WoW Death Knight, and the army theme was born. 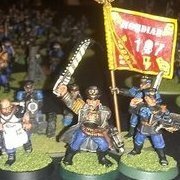 This was the first model I painted for the army. He was originally used as a Paladin in a DnD campaign, now he's my Arthas look-a-like Dark Apostle. A shot of the first completed squad of Berzerkers A group shot of the Berzerkers and HQ. Korghos Khul serves as my Exalted Champion My Obliterators. Inspired by the Khorne Lord of Skulls. I'm working on a couple of Rhinos now. After that I'm waiting on my order of Chaos Knights to arrive, which will be used as Chaos Bikers. Thanks for looking! Why my models aren't painted. I've been working on this mural for our game room at the shop. It's probably a little over halfway. About 15'x25' Top portion is missing from photo. Mindtaker Miniatures is a proud sponsor of OFCC and will have tables at the event for all three days. 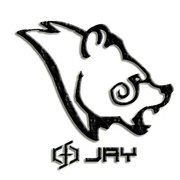 We will have our full stock with us for you to shop between events. This would also be a perfect opportunity to drop off a consignment or have us take a look at a lot that you have been thinking of liquidating while you're here. We can also give you a free estimated appraisal while you're at the event to give you an idea of what your items are worth and how much you could potentially make. In addition to our stock, we plan to have a table for last minute painting/miniature repair with paints, brushes and modelling tools available to anyone who needs it. 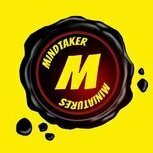 We at Mindtaker know that everyone got their painting done well in advance of the event, but just in case, we'll be there to help you out for any accidents that happened. Did someone ask for dudemans? Really? Are you sure you didn't ask for them? Well, since you're already here, have some dudemans. Finally getting around to setting up my new hobby work space. Still waiting on my third paint rack and currently building a second work bench to give me more space so it's still very much a WIP but here's a picture of it in its current state. Finished up last night just in time for bday party today. Hey doc, will please take a look at my Zug? It's got blood on it...? Got my first game in today. PL100, my CSM vs. Nato Sicarius's Necrons. It was the most fun I've had playing 40K in months. Leaving aside one Game back in February, the most fun I've had playing 40K since last OFCC. The game took about as long as a game of similar size in the same circumstances would have taken us in 7th, but this was our very first game with this rules set, vs. a couple of years' experience with 7th. I boxed my Land Raider in and wasted way too many Lascannon shots on his Ghost Arks (Quantum Shielding is amazing. Makes a huge difference in how you want to take those Vehicles down. Great Rule. ), plus ran my Bikes out too far unsupported, so I got kind of picked apart, and he had the board solidly locked down at the end of the Game. But I never felt like I was outclassed by his List the way I often have in 6th-7th.I made some screwups, and I had an inefficient list because there were so many things I wanted to try out. But still. I took a list with a Squad of Chaos Terminators in a Land Raider, a Sorcerer on foot, and a Terminator Chaos Lord, and did alright with it when I didn't make mistakes. I can't remember the last time I could say that. My brother is out of the ICU, so that is good news. Before I start, I just want to mention that I've ran this buy a moderator prior to posting in order to make sure I wasn't breaking any community rules: I am the Assistant Director for The Dalles-Wasco County Public Library, and we have a ton of exciting stuff going on at the moment. We just opened our new Teen Space which has a Steam Punk interior, and our Teen Librarian won Oregon Librarian of the Year. I was brought on recently to help their technology and am running their Maker Lab. I also was given permission to start using Tabletop Gaming as a STEAM (Science, Technology, Engineering, Art, and Math) education tool and have started a Tabletop Gaming club using the Games Workshop Universe (for now). At the end of our fiscal year we were able to buy the 8th Edition reference books, the Shadow Wars rule book, and some Sigmar Books, as well as the Dark Imperium Boxed Set. (Of which, all of the books are in an open circulation throughout the Oregon Sage Library system, so if any of you members want to check out one of our rule books on "library loan" go to your local Sage Library and place a hold. The hope is you can check out an index book to play with rules and army lists before comitting).I am currently looking around to see if anyone out there would be willing to donate terrain, models, or other items that the kidsin our club could use? As you know we work with a mostly poor demographic where most children, over 88%, qualify for free or reduced lunches. We are looking at using the Library as a way to plug some of the holes in the education system here, and our gaming club is turning out to be a good way for us to start focusing on basic math, art, english, and engineering skills. Since wargaming usually has such a high price point for people to get into, we are trying to build an infrastructure that allows for interested kids in the community to participate in a hobby that is typically out of their reach. Any and every donation will help us create a dynamic club where the kids can experience the totality of what the hobby has to offer, and hopefully this will inspire them to experiment with other programing and educational opportunities offered in our library. Since I'm also working on other elements of library, I'm also looking to see if there are any professional miniature painters in the area that may be willing to donate a table top paint job onto our Dark Imperium set? I know this is a huge request, and a total shot in the dark but I figured I would ask. I know this is a far fetched request but the momentum and energy we have at the library is really exciting and we are making huge inroads with the youth here and this gaming club has real promise. Any and every donation no matter how small can be treated as a tax deduction, and we are able to provide a receipt for all donations.Thank you for your time, if you do want to help us with anything feel free to pm me, and if you would like to speak with me personally by phone or email send me a PM and I will provide you with my contact information. Game on everyone! Hey all, I just want to say thanks for the great time at OFCC this year, this was my first year there as a player and it definitely met my expectations. Some great games and memories to carry on till the next one. As I said I went looking at the example lists when I got home. The Windrider thing is exactly what I needed to see. The Dark Eldar one did me no good in understanding it but I got ahold of my book after work and saw the Windryder. So it is as you say. I am glad it works this way. Hi Ordos, Over the weekend we upgraded the forums to the latest and grooviest version of our hosting platform. As you can see, the forums have changed a bit, with some new features and some deprecation of old stuff that wasn't used. There are some background tasks still running on the server, so there may be a bit of slowness from the site as it continues to metamorphosis into the beautiful new butterfly it is destined to become. Thanks for your patience over the weekend, and over the next week or so as we continue to sweep up dust, patch walls, and brush on some fresh paint. There's more exciting things to come, and we hope you enjoy all the new shininess! First up we have my ad mech. I’ve just started them. I will post more about them I’m the 40k forum later. Finally, a freaking update. I'm backing off the Chaos theme for now and going more generic. As such I built a big hill. It's split so it can be a bit more flexible, plus each half can fit in a 12 gallon tote. Rough foam form on beveled MDF Chipped slate fit into place with foam cutouts Foam shaping done with a wire wheel, sanding block and orbital sander Detail on the split. I tried to get the smooth slate edges to line up. I'll fill them later. WIP thoughts on the color scheme? Too bright? Just right? I finally had a chance to finish a long term project of mine and wanted to share. In mid 2016 I was able to pick up a Forge World Sicaran Battle Tank. A year and a half later it finally joins its brothers :) Hope you enjoy. So you use super thin super glue? Why not? Recent artwork by my daughter. Congrats, Jim Graham and Dark Curios! We just got the word in that Jim's board game Dark Curios made the finals at the Kublacon convention in San Francisco this weekend. Playtesters will rate it over the course of three days and we'll find out on Monday whether it placed 5th-2nd! Good luck, Jim! *winkyface* My game, Kingmaker, made the finals as well. This is going directly on my fridge. Then I'm gonna call my mom and tell her how stupid she is for ever doubting me. Then I'm gonna be too cool for everyone and I'll lose all my friends. Then I'll get heavy into coke and when people confront me about it, I'll turn it around on them because they don't know the pressure and responsibility of getting an A+ from Yarb. And then I'll die in the streets, after briefly living in the box that refrigerator came in. I'll breathe my last, clutching that A+ to my chest. So I guess what I'm really trying to say is thank you. Things are looking better from here on out! Terrain project I'm working on, excited to get to use this with the league ?? Hi, this year i wanted to work on something i started poking at a little bit before last years OFCC. i wanted to do a kind of lizardman in 40k kind of army and aztec themed marines combined. 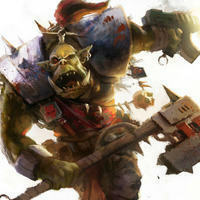 I figure i like the idea that the Slann were actually another race created by the same old ones who created the orks and fought the C'tan/Necrons. Some might have survived because Deus Ex warp and maybe were able to convince some marines possibly from one of the destroyed legions to work with them or maybe they just built their own cause space frog magic... Anyways here is what i started with. here are some color tests. i'm trying to go for a bright central american kind of color pallete and will try some animal prints and such. for the display board i'm doing like a jungle covered necron tomb i'm trying to remember to post pics as i get things done but for now this is my sneak peak. I've realized I don't really want an Arctic table. It looks cools, but It's far too limiting in variety. So I'll omit the snow. As such the first scatter terrain is done. Team D have all made it home safe and sound! I've seen a thank you thread that mostly seems to be oriented towards 9th Age, so I'm going to just put this here. I want to thank the HoG, the Ordo senators, and everyone who helped make this OFCC possible. It was laid-back, easy going, fun, and an absolute blast. In short, it was completely worth the trip out there and I can't wait to see everyone again next year! New edition! New models for the old army! I assembled the stock poxwalkers from the new box set, and wanted a Typhus to lead them/ With a few snips, I converted the axe of the Chaos Lord to a scythe, for my Typhus conversion: I was also MORTIFIED to discover that the Great Unclean One in the new book was less resilient and had fewer wounds than the Bloodthirster and the Lord of Change. WTF, GW? Papa Nurgle is big. Papa Nurgle is tough! Papa Nurgle deserves better! A Glottkin, a Chaos Renegade Knight kit, lots of putty, and a couple of days later, and I have a proper centerpiece for the new edition. My Knight Titan conversion. Poxwalker for scale.